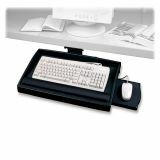 Master Mounting Arm for Keyboard, Mouse - Articulating keyboard arm with spacious 18-1/2" x 9-1/2" x 3/4" wood keyboard platform height adjusts and tilt adjusts in combination to keep wrists straight while typing. Offers 8" total height adjustment, 25 degree total angle adjustment, 360 degree swivel and 30 degree positive/negative tilt range. Platform accepts standard and ergonomic keyboards. Mouse tray attaches on right or left side. Unit includes 17" precision Teflon glide and soft-touch padded wrist rest for keyboard and mouse. Articulating keyboard's low profile design allows extra leg room. Meets or exceeds ANSI/BIFMA standards.